Previously we mentioned about VIA’s Nano (codenamed Isaiah) processor that may outperform Intel famous Atom processor and threaten its market position in certain segments based on pre silicon benchmarking data, now there seems to be a clearer picture that can prove the Nano as a solid winner in terms of actual performance benchmarking test being performed and released by some independent third parties. PC Perspective and HotHardware have been putting much effort to setup a standard test comparing BOXD945GCLF platform (with Intel Atom) against VIA Nano reference platform. One thing to point out here, it may not be apple to apple comparison since VIA Nano is clocking at 1.8GHz, which is around 12.5 percent faster than Intel Atom at only 1.6GHz. Even taking this into consideration, VIA Nano still outperforms Intel Atom in most of the CPU benchmarking tests include those industrial standard 3DMark06 and PCMark06 that stress mostly on CPU and memory access. Based on actual figures, VIA Nano can perform at least 25 percent faster than Intel Atom in overall test results. No doubt, VIA Nano’s Out-of-Order execution has able to handle multiple complicated executions better as compared to Intel Atom’s In-Order execution even with Hyper-threading feature enabled. Besides actual silicon performance, VIA’s platform is claimed to be an open platform that allows developers to explore and put in as much features as possible, as opposed to Intel conservative strategy with limited access to its X86 low level architecture. 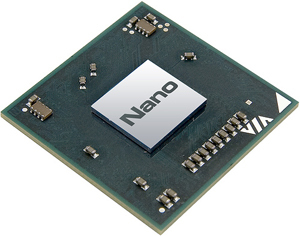 Furthermore, Nano processor is pin to pin compatible to C7 processor that makes it drop in replaceable as a quick successor for existing VIA’s C7 flavored board vendors. Nevertheless, Intel Atom still stands a great advantage in terms of low power consumption and ultra small form factor. Thanks to its 45-nanometer process technology that able to fabricate much thermal efficient silicon at a much smaller foot print. So, depending on what the targeted market segment is, Intel Atom is still suitable for some small size battery operated devices such as MID (Mobile Internet Device), while VIA’s Nano can be used to handle more CPU intensive applications especially for those needed to be in UMPC (Ultra Mobile PC) or even Nettop for daily usage.